Aegean art covers two major pre-Greek civilizations: the Minoans and the Mycenaeans. This unit provides a nice segue between ancient Near Eastern (Mesopotamian and Egyptian) art and Greek art. Both the Minoans and the Mycenaeans were influenced by these earlier civilzations (their writing systems, for instance, are thought to be adaptations of Egyptian and Mesopotamian systems), and the Mycenaeans, who eventually colonized Minoan Crete, were the immediate forerunners of the ancient Greeks. This unit is a wonderful place to talk about the ways that artistic representation expresses cultural values: for the Minoans, in terms of their relationship to the environment, and for the Mycenaeans, in terms of displays of political power. These two concepts are still very palpable in students’ lives today, and it’s fun to use this lesson as a way for them to think about how contemporary visual culture relates to our social, political, and geographic relationships. This is also good chance to introduce the concept of institutional history, or historiography. Both the Minoan and Mycenaean sites were discovered and excavated around the turn of the last century by Western archaeologists, who had their own culturally specific agendas. Finally, this unit is a wonderful opportunity to introduce the question of epistemology: how do we know what we know? The Minoan culture is an especially good place to get students to question their assumptions about what art means. 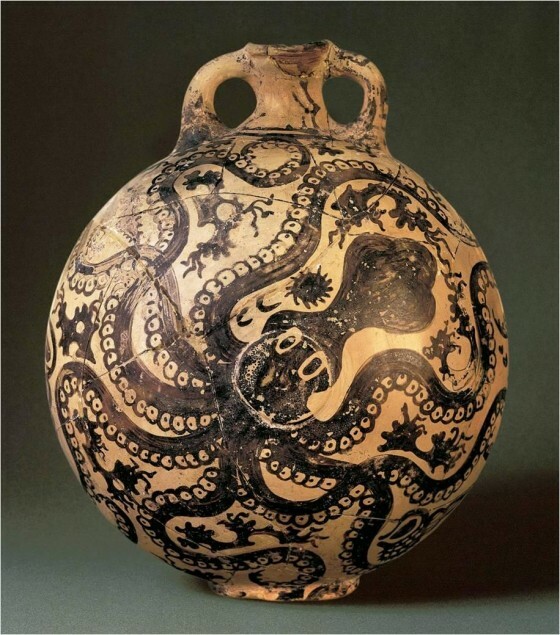 You might begin the class by showing a simple Minoan object such as the Octopus Flask, and ask students to do a quick free write about what they think it symbolizes or represents. Then, either right away or later in the lesson, you can ask students to think about what evidence they would need in order to prove their theories—evidence that is unlikely to be available, since we have no decipherable written documents from the Minoan culture and thus know little about their specific beliefs and traditions. Octopus Flask, Minoan, c. 1500 BCE. Background reading could include excerpts from your course textbook, the thematic essays on Minoan and Mycenaean art from the Met’s Heilbrunn Timeline of Art History, and the Metropolitan Museum of Art’s Teacher Guide, which covers the history of these cultures in detail. A good article titled “The Greek Age of Heroes: Myth Becomes History” by Carol G. Thomas is available through the Bulletin of The Historical Society (Boston)—this is a nice discussion of key German archeologist Heinrich Schliemann’s conflation of Homeric myths with archaeological research. As for web resources, Undergraduate student Heather Gustafson (University of South Florida) has created a really nice, simple web overview of Knossos, which discusses Arthur Evans and the reconstruction of Minoan frescoes. This is not only a good example of a student research paper, but connects directly to the themes of institutional critique, historiography, and epistemology. 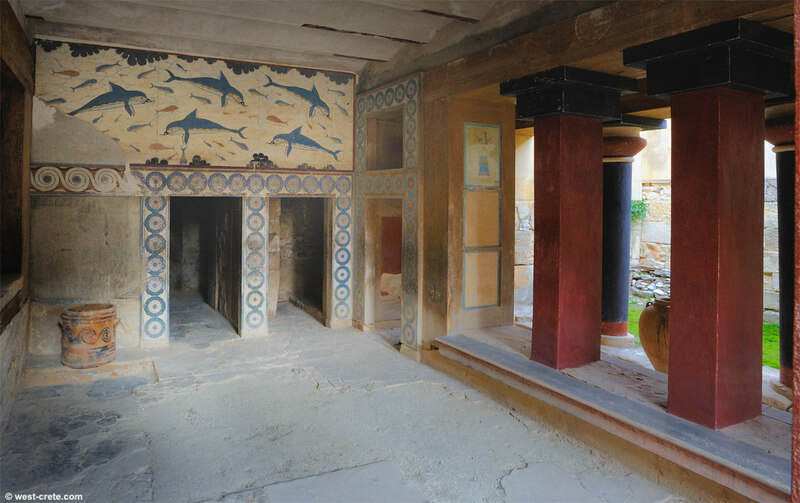 The British School at Athens has an online virtual tour of Knossos with lots of good images. Classicist Janice Siegel (aka “Dr. J.”) of Hampden-Sydney College has an amazingly detailed website on many classical sites, including Mycenae. For a more simple introduction, Rick Steves has a great, short video clip on Mycenae. How are a society’s structure and values reflected in their art and architecture? How do we know what we know about these societies, and what conclusions can we (or can’t we) draw from the available evidence? The Minoan civilization (c. 3500–1050 BCE: named for the legendary King Minos, keeper of the Minotaur, by twentieth-century archaeologist Arthur Evans, who thought the ruins were similar to the mythical labyrinth) on the island of Crete was an agrarian society whose livelihood depended on farming, fishing, and sea trade. Returning to the Octopus Flask from your first activity, you might ask your class to ruminate on how these aspects of their society are reflected in their art. How can we tell, without written documents, that the sea was important to them? What can the intended use of this object (as a flask for holding olive oil or wine) tell us about how the society functioned economically? A preference for aquatic motifs is further evidenced in the Dolphin Fresco from the ruins of Knossos, the capital among the Minoans’ four major urban centers. This is a great point at which to discuss the medium of fresco, which students will see again in later units. The “Palace” (its twentieth-century appellation) at Knossos was actually a very large, urban complex comprising many kinds of spaces, including storage areas for olive oil, workshops, meeting rooms, and possibly ceremonial spaces as well, in addition to the royal living quarters. 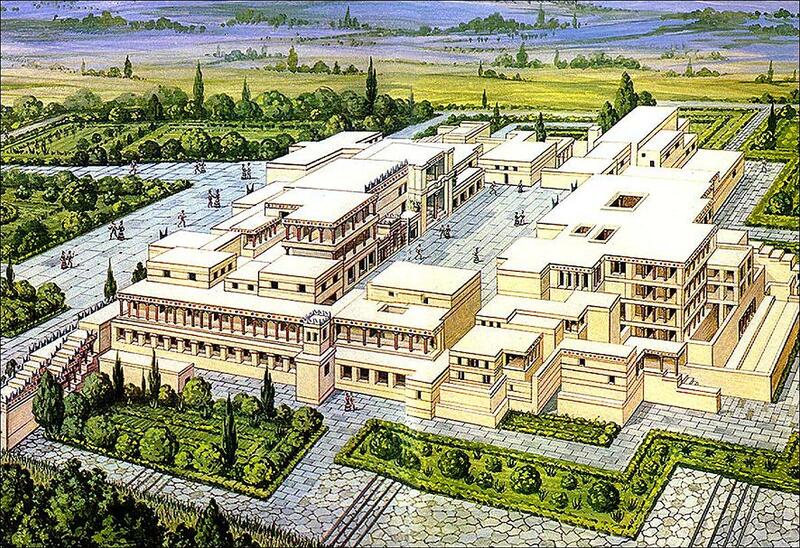 The Minoans were talented engineers: the “Palace” had a highly-functioning water system, including toilets that flushed. The “Queen’s Megaron” (home to the dolphin frescoes) is a good example of the kinds of spaces that the palace contained: open to the air through a colonnade on one side, it would’ve been comfortable year-round in the hot climate of the Mediterranean. Again, we don’t (and can’t) know for sure that this was actually the “Queen’s Megaron” (“Megaron” means “main room”)—this was the interpretation given to it by Evans. Another Minoan mystery is bull-leaping, an activity depicted in several Minoan frescoes (here, the so-called Bull-Leaping Fresco) and sculptures where young men and women appear to perform acrobatic feats with these animals. This activity may have had a religious meaning, though the exact significance remains unclear. This is a great point in the lecture to emphasize the value of deciphering iconography: could we find out what this image actually depicted? Was it a real ceremony? If so, does it depict three people, or is there a narrative arc in the image depicting one person acting over time (i.e., leaping over the bull)? Is it a symbolic allusion to heavenly constellations (Orion and Taurus), as certain scholars have suggested? Something else? How can we know? Why have archaeologists and art historians “read” these images in these ways? What types of evidence did they/would we need in order to be sure, or, at the very least, to mount a convincing argument? As a commercial society, the Minoans relied on written communication, first using a pictographic system probably adapted from Egyptian hieroglyphs, and then a linear one (which archeologists have dubbed “Linear A”), which is possibly an offshoot or version of Mesopotamian cuneiform. However, because Linear A has yet to be deciphered, much about the Minoan civilization (including what these people actually called themselves, and the intended meaning of the bull-leaping frescoes and other works of art) remains unknown. What we can see in the bull-leaping frescoes, as well as in other works from Knossos and from neighboring Akrotiri, are clear artistic conventions that read as a distinct style. These conventions include the depiction of figures in profile, differing skin tones used to depict men (reddish-brown) and women (white), strong linearity, and a sense of movement and dynamism. The Mycenaean culture arose on the Greek mainland around the same time as the Minoans, and they also had a writing system (called “Linear B” by archaeologists) which has been deciphered. Their language was a very early form of Greek, making them the closest forerunners to the classical Greek civilization that your students will learn about in a later unit. Like the Minoan sites, Mycenae was excavated by a Western European archaeologist, Heinrich Schliemann, in the late nineteenth century. He was looking for evidence of the Homeric epics (the Iliad and the Odyssey), especially the legendary city of Troy. He claimed that Mycenae was the mythical and historical home of King Agamemnon, which is why one of the objects found there is still commonly referred to as the “Mask of Agamemnon.” Again, we are confronted here with the problem of verifying such claims. As a society that was prone to military conflict, Mycenae takes the form of a citadel—a fortified palace complex surrounded by thick masonry walls and set on an easily defensible hill with sharp cliffs. This stands in stark contrast to the mercantile city Knossos, with its open design. The Mycenaeans’ wealth and power were displayed at the main entrance by the relief figures of two lions (called the “Lion or Lioness Gate”). Some historians surmise that their heads may have been made from bronze or gold, and were thus looted—there are still holes in the stone where their heads would have been attached. Here, again, we can ask how we know what we know: can we know whether the lions are male or female? Why would the Mycenaeans have chosen lions for this work? What do they symbolize? Can we know for sure? Though we don’t know of any symbolic meaning or historical importance of lions within this society, we can be fairly certain that they stood there in order to represent the power and prestige of the Mycenaeans. Powerful, intimidating animals, the lions, with their shining heads (assuming they were made from precious materials), would have helped display the wealth and might of these people to any visitor or intruder. Like the Minoans, the Mycenaeans were also great engineers. They created massive, domed burial chambers (tholos or beehive tombs), such as the so-called “Tomb of Agamemnon,” that were spectacular for their time. The technique they used was the corbeled vault: the practice of laying stones on top of one another horizontally, with each layer positioned slightly further inward than the previous one, and balanced by other stones or, in this case, earth laid next to and on top of them. This is a good moment to discuss the difference between an arch and a vault. You can also take this opportunity to introduce the vocabulary of post and lintel construction, seen in the doorway of the tomb. When they were first discovered by Schliemann, these graves held many gold burial objects, including the aforementioned “Mask of Agamemnon.” In addition to helping your students question how and why art objects get named, the mask is also a great example for discussing gold-working techniques such as repoussé, as well as formal qualities like the reductive stylization of the facial features. You could also use this object to compare Mycenaean burial practices to other funerary cultures such as those in ancient Egypt or Latin America. Finally, there is evidence of mutual influence between Mycenaean and Minoan culture on the creation of pottery. The Stirrup Jar with Octopus displays a similar penchant for sea creature motifs, but the figure is depicted much more abstractly. The Stirrup Jar with Octopus makes for a great compare-and-contrast exercise when paired with the Octopus Flask. You might have your students do a quick five-minute free write comparing the two objects and practicing the formal vocabulary they’ve learned (abstraction, figuration, linearity, stylization, and so on). Alternatively, you could return to the Octopus Flask and continue your discussion of evidence. One way to do this exercise might be to have the students imagine that they are archaeologists from the future, coming upon a simple object from our own time, such as a mug with a picture of the Statue of Liberty on it. Without any written evidence to accompany it, what kinds of conclusions might such a person draw from simply looking at the object? Would they be correct? Help them explore the limits of what they can know from purely visual evidence. Finally, a third option for a quick end-of-class activity would be to have students design their own version of the Octopus Flask or Lion(ess) Gate. If they were to create objects like this with themes from today’s world, what would they pick? How do these themes express our own culture’s values—our means of livelihood, our aesthetic preferences, and/or our means of political power? Naraelle Hohensee is Managing Editor at Smarthistory and a digital content producer for education. You can reach her at naraelle@gmail.com or on Twitter or Instagram @naraelle.